Well Spring Break has come and gone. I feel like most of the people I know were either at the beach or in New York City or somewhere else fabulous. We had a staycation but it was a good time of rest and we worked in some fun. My girls went to my parents house for the weekend. They had a great time and my parents brought them back on Monday afternoon. Monday morning Will Holden and I worked in a grocery store trip. 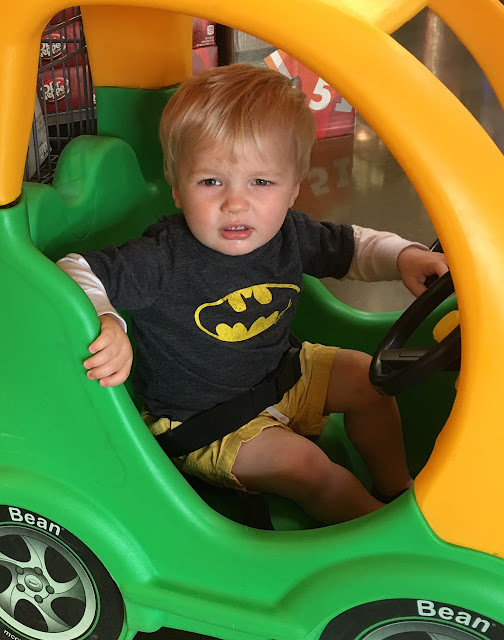 He didn't love the car shopping cart like I had hoped he might. And then I got him a big boy hair cut. Why does this always make him look so old? Tuesday morning my friend Melissa invited us over to play and do crafts. Our two youngest are the same age and good friends at school and church. We had a great time visiting and crafting. My friend Maegan took her daughter and Hollis to get Sonic drinks and pedicures! Such a treat for these six year olds. They look like teenagers in this picture. I love that they have been friends since they were in the baby nursery! Hollis didn't want a birthday party this year. Instead she wanted to have a special day with her friends. It worked out great that we could do this over spring break. I had a sitter for Will Holden during his lunch/nap time and I took the girls and Hollis' best friend Joseph to eat Mexican food. We have this cheap mexican restaurant by our house and it's my girls' favorite. (and mine). We have burnt Scott out on it so we have to sneak it in when he's not around. ha! Hollis really wanted to go bowling so we did just that! It was a fun day! On Thursday we had a similar day only with Hollis' two girl friends. Hollis loves Chuy's (mostly because they have push pops at the end of the meal). We had a fun lunch with these three (and Harper). How cute are they??? Another old picture from their nursery days. 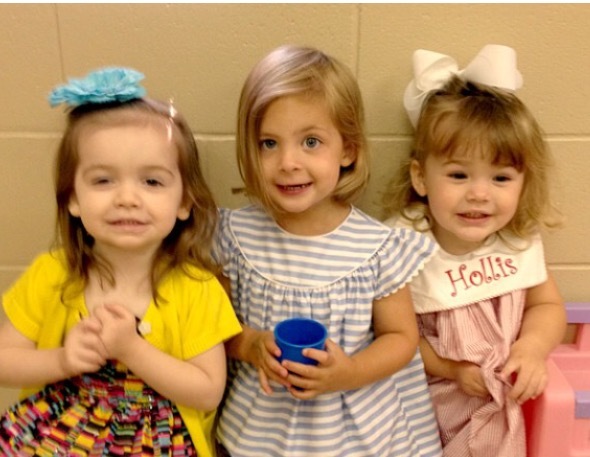 It's hard to believe how quickly these three have gone from toddlers to kindergarteners. The other request was a visit to Claire's. The girls got to pick out special treats. It was a very fun and girly day! Friday we ran errands and spent a little birthday money. The weather wasn't great for most of spring break - a lot of gloomy, rainy days but my girls had a lot of fun just playing together. And spring break seemed to wear this boy out. He slept until 7:30 every day and took long naps. It was actually a really great week! Saturday was Scott's birthday. I tried to talk him into going out of town or doing something fun but he really just wanted a day at home with his family. It was rainy and gloomy and we just relaxed at home all day. We went out to eat for dinner and had birthday cake and pie! (yes both!) I'm so thankful for my family. This week is going to be busy so I'm thankful we had a slower week to just enjoy.